In the past several weeks, I have spent part of my time focusing on NLEM’s Memorial Collection. Since 1992, visitors to the National Law Enforcement Officers Memorial have demonstrated their emotional connection to and regard for law enforcement’s fallen by leaving tribute objects. It is those objects—some commonplace, some unique, but all holding meaning for those who left them—that comprise the Museum’s Memorial Collection. Wishing to gain a deeper understanding of this eclectic and evocative collection’s role in our Museum, I have explored some of the ideas that inform American memorial institutions. I believe—and I still do, in spite of everything—that memory is a shield. If we remember what people can do to each other, then we can help those who tomorrow may be threatened by the same enemy to do something. . . . I believe that he or she who listens to a survivor becomes a witness. This quote resonates with me, because it speaks to the relevance and importance of such institutions of the NLEM and the NLEOMF. For me, the objects in the Memorial Collection are physical reminders that help me understand the importance of the sacrifices they memorialize. The objects left as tribute serve to express the memory of past sacrifice and can serve to remind the larger community of witnesses of the vital role that law enforcement has in civil society. As a child I collected post cards. My parents traveled a lot and sent me pictures from where they visited. I saved them all. As I got older, I began to buy postcards as remembrances of my trips. Post cards continued to interest me as an adult, and in my current position, they help document the work of law enforcement. But I had forgotten the amazing stories a post card can hold—especially one without a picture! 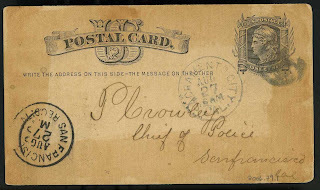 In the NLEM collection is a run-of-the-mill postcard mailed by the Chief of Police in Sacramento to the Chief of Police in San Francisco in August 1880. 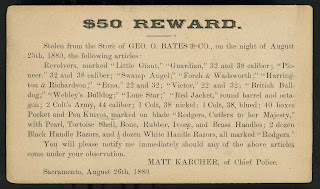 The card, originally one of many such cards sent to Chiefs of Police (and most likely Sheriffs), described at length the items taken during a robbery. But with a little more research, the post card brought to life two important California citizens: the man who sent the card—Matthew Karcher—and the man who received it—Patrick Crowley. Geo. Bates and Co. robbery postcard, 1880. 2006.79.1. Collection of the NLEM, Washington, DC. Matthew Karcher was an American success story. Born in Baden, Germany, in 1832, he emigrated to the United States and eventually made his way to Sacramento. That same year, 1851, he opened a bakery which he ran for 14 years until it was destroyed by flood and fire. Having a family and no work, he was offered a position on the Sacramento police force and accepted it. Apparently he did well, running for and being elected Chief of Police for almost 10 years. He later served as a deputy sheriff. 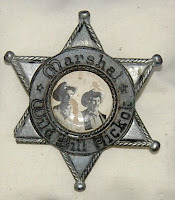 Little did the Museum staff know when we acquired the post card that it would shed light on two important settlers, as well as important California peace officers. Karcher, the immigrant who realized the American dream , and Crowley, an individual who experience the dramatic growth of an American city—captured on a small postcard. How is museum learning different from learning in other settings? There are many answers to that question, but one important answer is that museum learning focuses on objects, not just ideas. It’s a unique approach, and it happens more often in daily life than you might think. Here’s a case in point. A couple of months ago, I saw an antique tractor pull at the Montgomery County (MD) Fair. As I watched the tractors chug across the arena, I wondered whether any of them resembled the tractor my Great-aunt Leslie accidentally backed into the side of a barn when she was learning how to drive more than 60 years ago. She and my Grandpa (her brother, who repaired the damage) still laugh over the incident. Back home, I called Grandpa to ask what kind of tractor his family owned on the Ewing farm. 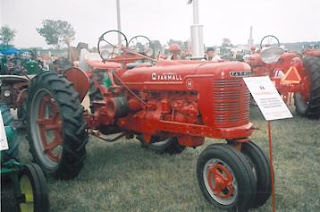 He told me it was a 1943 Farmall Model H, and then launched into a conversation about tractor manufacturers. My Grandma, who doesn’t like to talk about her childhood on the farm, volunteered that the early John Deere tractors were called “put-puts,” because of the sound the two-cylinder engines made. Later, my parents and I talked about tractors. Dad remembered working with Grandma’s father, driving the tractor when he was 12 or 13 years old. I learned more about the serious accident that injured Great-grandpa just a few years later and about how a farm family without insurance or workers’ compensation survived. A few weeks later, Grandpa attended an antique tractor show and snapped a photo of a tractor just like the one he’d used growing up. “I drove it thousands of hours!” he related in the caption. And I learned all of this because of a tractor. You may have had a similar conversation over a box of items saved from high school or with a child about the toys they loved as a baby. One object can spark conversations about many topics, and you talk about them because the object has meaning for you. As a museum educator, I’m committed to creating ways to allow visitors to talk about the Museum’s objects, not because they’re in the collection, but because they mean something to our visitors. 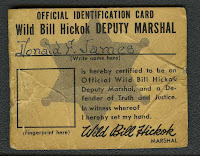 Both items relate to the television and radio show, The Adventures of Wild Bill Hickok, which ran from 1951-1958. Was this sold as a cereal item? Are there any others like this out there? Did you have one of these, or an item like it? What are your memories? We are also looking for information and items related to portrayals of law enforcement in movies, television and radio. So, if you have an object or have any information, leave me a comment!